MERRY CHRISTMAS TO YOU ON SEPTEMBER 24! Ok, I am sure many of you will hate me for this but....I have been listening to Christmas music since the beginning of September!!!! I just LOVE Christmas music and I am always searching for new, beautiful Christmas music to listen to soothe my soul, give me happy, holiday spirit, and give me some great music to sing and dance to with my children! 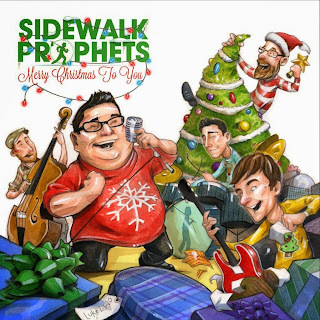 Lately, my family and I have been listening to the new Christmas album from one of our favorite Christian bands, Sidewalk Prophets! I love this album - it is fun and upbeat but also features some of the classic Christmas favorites! Buy It: You can purchase the Merry Christmas to You CD for only $9.99 from the Sidewalk Prophets online store.